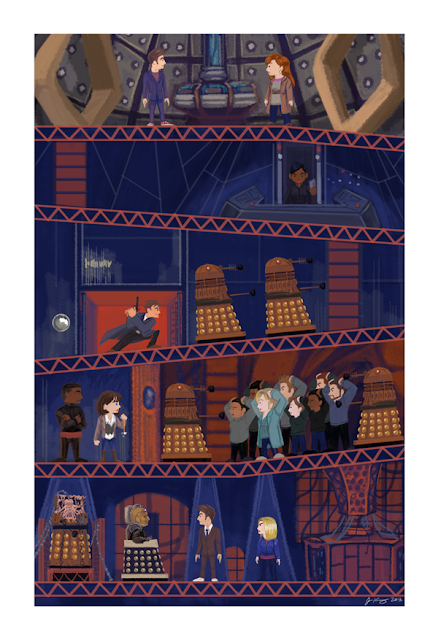 This is my piece for Meltdown's Doctor Who Tribute Art Show: The Doctor is In! The 10th Doctor episode is one of my favorites, I loved all the gathering of the companions, I loved their strength and how they band together even though they are strangers, I loved DONNA in this since she shows how brilliant she is! The piece pulls inspiration from that episode, and Donkey Kong. XD I thought it'd be fun to show the events that happen in that episode in this way since the Dalek ship, the Crucible, seem to have multiple floors for different functions, with Davros in the dungeon and stuff. I wanted to put in an extra floor to show the Dalek King but I thought it was more important to focus on the Doctor and his companions.